Well, Saturday blew in nasty; snow, sleet and driving rain with a strong wind that drove most of the remaining maple leaves out of the yard. The temperature did not help either as it was hovering around 32 to 36 degrees. However Saturday was the day the turkey hens decided to return at about 30 strong. 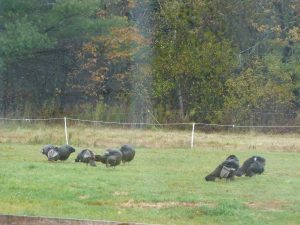 They did not seem to mind the weather as they rumaged around in the vegetable garden, but before long filed back into the woods at the edge of the pasture.